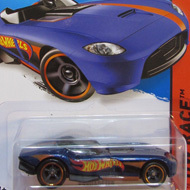 73/250 is part of the HW City series and the 2015 Super Treasure Hunt set. 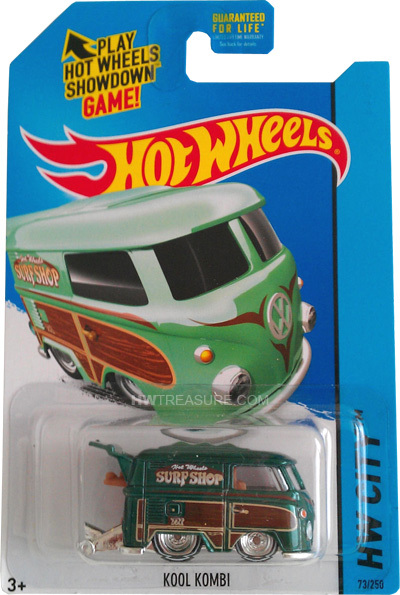 The Spectraflame green Volkswagen features “Hot Wheels Surf Shop”, wood graphics, “TH”, and the Hot Wheels logo on the sides. It has clear windows, a tan interior, Real Rider Steelie wheels, and an unpainted metal Malaysia base. The Kombi made its debut in the 2013 HW Showroom series. It is based upon a Volkswagen Type 2 modified with an open back, rear spoiler, and wheelie bars.